Asus' attempt at an ultraportable laptop might not have made the same splash in the technology world as Apple, Sony or Dell, but the U36J has a couple of good features that make it a likeable alternative, and the perfect accompaniment to the daily commute or a weekend away. Outwardly, the U36J is an unassuming, black rectangle. In fact, the chassis is similar to that of the Sony VAIO C Series. We don't mind the matt-black executive look, but it will put off anyone who likes a bit more colour sitting on their desk. The 13.3-inch screen is bright and crisp, although the thick black bezel and ugly protruding hinges are slightly distracting. Fortunately, Asus has become quite adept at giving their laptops great usability and the U36J is no exception. The isolation-style keyboard is superb, with plenty of space between keys, meaning we rarely hit the wrong keys when touch-typing. Because this is such a slim laptop, the keys are tucked in close to the chassis and there's little travel when typing. The touchpad has the same smooth plastic surface as the palmrests and works well. Asus has included a fingerprint scanner between the mouse buttons. Performance-wise, the U36J gave us some impressive results that make its low price tag even more appealing. The Intel Core i5 M460 CPU delivers 2.53GHz of speed bolstered by the 4GB of memory. This kind of spec is great for general performance, but the integrated GPU means no heavy gaming on this laptop. But you should be able to run some older titles and do light photo editing. 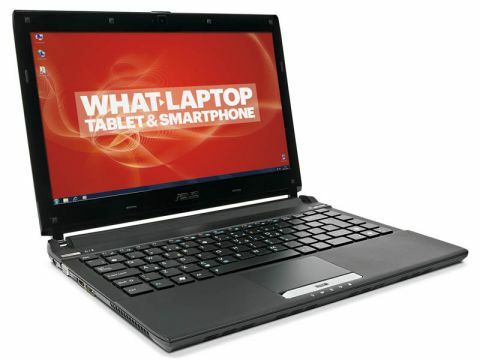 In terms of software, the U36J comes pre-loaded with around 15 native Asus applications. Although there is no optical drive, there are three USB ports, one of which is the faster USB 3.0 connection. Both an HDMI and VGA port mean you can attach a second monitor or HDTV to the U36J and an Ethernet port means you don't have to settle for the 802.11n Wi-Fi connection. There is also an SD/MS Card slot for expanding the memory. Two of the biggest positives we drew from the U36J though are the battery life and the price. During our intensive tests, the Asus recorded a strong score of 226 minutes, but we think that with sensible everyday usage you should easily be able to get over four hours out of this laptop and probably more if you use the included battery management software. We'd expect to pay around £800–£900 for this type of machine, seeing as the Sony C Series and MacBook Air are both nudging a thousand pounds. Instead, you can get it for only £700. Overall then, while this is certainly not the best ultraportable you can buy, it is the best value for money. So if your cash is tight this month, we'd recommend giving the U36J the once over at your local computer store before buying something pricier.